If you don't have the poached fruit you can just add 1 cup of raisins. This is a jar of a nationally distributed pineapple-coconut juice blend. You can also mix a 14 ounce can of coconut milk with a cup of pineapple juice and cup of water. This is an assortment of dried fruit that was purchased from the bulk bins. You can simply purchase an ounce of one fruit and a couple ounces of another. The only sweetened fruit was the pineapple, the rest are unsweetened. You can use more of one fruit and less of another if you wish. Slice the dried fruit into small bite-size pieces. Place the cut fruit into a large pan. Add water and place onto the stove. Bring water to a boil and stir a few times. Let fruit boil for a minute or so. Cover the pan and boil for another minute. Remove the pan from the heat and let it rest, covered, for ten minutes. 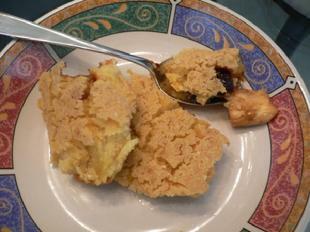 Place cooked fruit into a four quart baking dish. Be sure to spread the fruit evenly across the dish. Place cornmeal, flour and salt into a bowl. Add pineapple-coconut juice to the bowl. Mix all ingredients together to make a batter. Gently pour batter over the fruit. Place dish into the hot oven. Turn oven off and let the dish bake for another half hour. Remove the dish and let rest on the counter for another hour before serving. 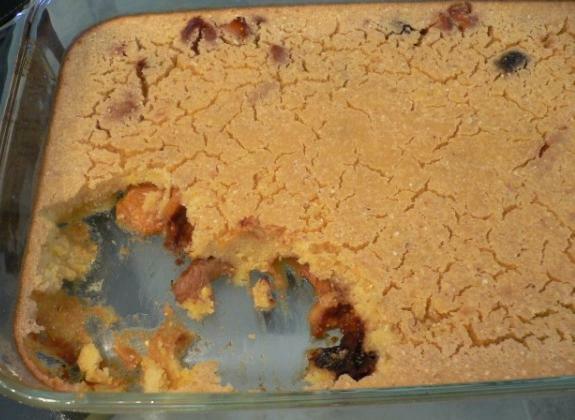 Scoop pudding from the baking dish. Serve on a plate with a spoon.